A human factors research scientist, Andrew Smart received B.S. and M.S. degrees from Lund University in Lund, Sweden, where he worked on using noise to improve memory and attention in children with ADHD. As a research scientist at New York University, he analyzed brain imaging data from experiments on the neural basis of language. His recent work includes developing sensor-based indices of cognitive effort among cancer and stroke survivors. 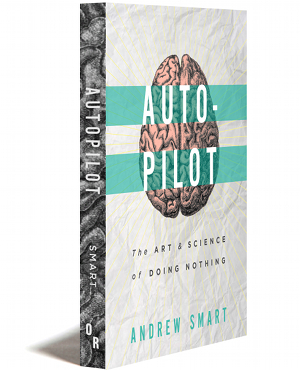 Autopilot: The Art & Science of Doing Nothing is his first book. Just as it is unsettling to imagine there may actually be a “dark side of the force” that we know almost nothing about, it is spooky that our brains are doing all this stuff while we sit and stare into space. For much of the history of modern science, what has appeared to be noise actually represents a deeper truth that we do not yet comprehend. In neuroscience and psychology, the brain’s spontaneous activity has been considered noise until very recently. But it could turn out that this noise holds the key to truly understanding our minds. Eventually physicists had to accept that if our knowledge of the universe is not completely wrong, then the universe is mostly made from dark energy. Similarly, it is possible that much of the brain is being ignored by cognitive neuroscience and psychology. Psychological brain imaging experiments are designed to test brain activation levels during specific tasks in order to find out what certain brain structures are doing during those specific tasks. In Chapter 1, I pointed out that an assumption in brain science is that any activity detected that is not affected by experimental manipulations is just noise. Until its existence was verified, the brain’s resting state network was usually considered someone else’s noise. Do not confuse this with the myth that we only use 10% of our brains. What science has revealed is that we use all of our brain, just not in the ways many people assume. Only minor perturbations occur in the brain’s ongoing activity during a mental task like adding something to your to-do list. For example, the neural energy required to press a button whenever a red light appears in a laboratory experiment is only a small fraction (as little as 0.5%) of the total energy that the brain expends at any moment. In contrast, the default mode of your brain uses a far higher percentage of your brain’s total energy. Figuring out just what the brain is doing while consuming all that energy when you are spacing out is precisely what Marcus Raichle and other neuroscientists are beginning to do. One of the striking things about our brains is that in terms of energy consumption, they are as greedy as Goldman-Sachs. The brain represents about 2% of your total body weight, yet it consumes 20% of your body’s energy. It is the biological equivalent of the 1%. In other words, your brain is a pig and it is selfish. This may be why ultra-endurance athletes can start to hallucinate after running fifty miles, or when participating in the grueling bicycle contest such as Race Across America during which cyclists ride almost non-stop from California to Maryland. When blood sugar gets low during some insane endurance challenge for example, and you are sleep deprived, your conscious awareness is the first thing in your body to start experiencing problems. This is true in general and especially during exercise. Unnecessary-for-immediate-survival brain operations like having coherent thoughts are sacrificed in order for the brain to be able to maintain vital functions like respiration during a drop in glucose, electrolytes, or water. Confusion and hallucinations are also warnings from our brain that we are dangerously close to doing damage to our bodies. The next step is passing out. This is the brain’s last-ditch way of protecting our bodies from exercising to death. It doesn’t always work. Every year several participants in marathons die because they inadvertently pushed their brains and bodies beyond certain critical limits. The brain will keep trying to consume its disproportionate share of your body’s energy. That’s why when your body runs out of energy you become a drooling zombie. Now, imagine that running yourself to death in a marathon is a compressed version of your entire life. During the marathon, as you approach the limits of your body’s capacity to withstand stress, your brain will keep giving you warnings. Your muscles will feel fatigued, and you will start to have an overwhelming urge to stop. You may become disoriented and have momentary lapses in awareness. Some people can override these warnings and push themselves past the point of no return. Over the long term in a less intense, but no less insidious way, our brains are constantly warning us that we work far too much. On the time-scale of a lifetime, constant stress from over-work raises your risk of depression, heart-disease, stroke, and certain kinds of cancer. It’s a long, horrible list.